When it comes to wedding rings, couples should get what they can afford but never compromise quality. If the bride or groom insists on an expensive ring, even when it’s unaffordable, that couple has problems already. There’s nothing wrong with cheap wedding rings if they look good, are given from the heart, and are made from sturdy, high quality materials. Cheap wedding rings should be named affordable wedding rings or inexpensive wedding rings. The word cheap seems to have a connotation of inferior quality and this should never be the case. Even affordable wedding rings should be made from quality products. Novori Jewelry sells thousands of affordable wedding rings for anyone on a budget that have a low price but are custom made in the USA with quality products. We never import engagement rings or wedding rings in from third world countries. Before buying an inexpensive wedding ring online, ask where the ring is made. You may be surprised. However, you shouldn't’t try to fool a person into thinking a ring is something that it’s not. For example, if you choose a cubic zirconia ring, don’t try to fool your partner into thinking it’s a natural diamond. If the person loves the ring, then they shouldn’t have a problem with it not containing a natural diamond. Just promise a real diamond in the future. She'll understand. Cubic zirconia is a low cost, low quality alternative to natural diamonds. They look good, but cost much less and generally don't last very long. They are simply not as hard as a real diamond ring. So if you’re looking for cheap wedding rings, don’t rule cubic zirconia out of the picture, but be careful. 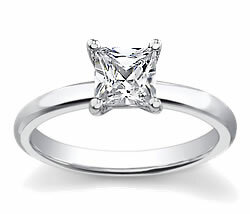 You may even find that with our low internet pricing on diamond rings you can actually afford a real diamond ring. It’s unfortunate that so many people judge wedding rings by their monetary value. Struggling to pay for an expensive wedding ring isn’t a good way to start a marriage. Cheap wedding rings are out there, and don’t think that cheap means worthless. When it comes to wedding rings, it really is the thought that counts. There’s nothing wrong with buying an expensive ring if it’s within your budget. But if it’s not, there are plenty of cheap engagement rings that have quality, class, and looks. An important point to remember is that one person cheap is another person’s expensive. So the very idea of cheap wedding rings is relative. Some retail jewelry stores put their regularly prices merchandise on sale during certain times of the year. So what you think are cheap wedding rings may in fact be discounted expensive wedding rings. And the same is true with the online jewelry market. Since online jewelry stores don’t normally have the same expenses as brick and mortar retail locations, they can charge much less for their inventory. A normal store may add charges to help pay for utilities, decorations, and a number of other things. But an online jeweler doesn’t worry about those things. An online jewelry store may appear to sell cheap wedding rings, when in fact they are the same rings as the higher priced selection in your local store. Jewelry styles change all the time. What was in demand back in August may be old news by June. So what do jewelers do with that extra inventory? They put the items on sale. Some cheap wedding rings are cheap simply because the stock has to go. It doesn’t mean the rings aren’t any good, it doesn’t mean they’re damaged either, it simply means the rings must go. You will find that online jewelry stores also have clearance sales. Online stores have inventory just like regular stores. So don’t miss a great bargain by thinking you must shop at local jewelry stores. In fact, most online jewelry stores offer the option to search by price. So if you’re looking for cheap wedding rings, you don’t have to view pages of rings that aren’t in your budget. The first thing you must do is decide on a budget. Can you afford to spend four months work of pay on the ring? If not, then don’t do it. Establish a budget that’s reasonable for your situation and stick to it. If cheap engagement rings are all you can afford to look at, then some options will not be available. For example, platinum is very expensive. So the cheapest platinum ring would probably still be too expensive. Large diamonds are also expensive. If you’re searching for cheap wedding rings, then you probably also can’t afford a very large diamond. Go for low karat diamonds instead or gemstones other than diamonds. If you must have a diamond, consider one that’s less than perfect. Diamonds that contain flaws are usually cheaper than more perfect ones. It might be a good idea to get acquainted with the grading scale used for diamonds. That way you’ll be more comfortable while choosing a diamond. Besides, most diamonds have small flaws that are only recognizable by professionals or with magnifying tools. So a low-grade diamond can be a real bargain, but look like a million bucks. Online jewelry stores. Online jewelry stores offer beautiful cheap wedding rings. The rings are often good quality, but the online jeweler can afford to sell them for less. You will find that Novori Jewelry has the best prices online. Check it out. You can actually get a nice-quality ring inexpensively through an online jewelry stores like Novori Jewelry. Buy an imitation diamond for the ring. Very few people can tell the difference between a naturally created diamond and a man-made cubic zirconia or moisannite. Visit Estate Sales or Auctions. It’s not uncommon to find amazing cheap wedding rings at auctions and estate sales. You’d be surprised at the great deals you can find, but know what to look for and how to determine a real diamond from a fake so you don't get swindled. Remember, pick a ring that’s within your budget. If very expensive rings are in your budget, then that’s great. But if cheap wedding rings are all you can afford, then that’s great too. Best of all you can know that Novori Jewelry has affordable wedding rings and some of the best prices on loose diamonds on the internet. We know we can find you a real diamond ring that she will love. Just call us if you need assistance finding the perfect engagement ring. You can reach us toll free at 1-877-877-4141. Browse our great selection of inexpensive wedding rings now.